One of the most important things when putting on poly is to make sure the floors are clean, lint and dust-free. Let me say this again. Vacuum, vacuum, and vacuum again! Use those tack cloths like it's your JOB! Block up those vents with plastic because there IS junk in your vents and it WILL blow onto your finish! We didn't block off the vents for the first few coats and that made us have to do a fourth coat, which just sucked. When getting everything ready, it is imperitive that you prep your lambskin applicator. Take some tape to it over and over again, get those loose fibers out of there. I spent about 20 minutes with each applicator taping it to remove those fuzzies that look terrible in your finish. Then, rinse it out with mineral spirits and let it dry a bit before using it. If you are using water-based poly, use the applicator recommended to you for that finish. We started in the dressing room, and we didn’t think it would matter whether we went with the grain of the wood, so we went across it on the first coat. Don’t do this! You can see the stroke marks, so always go with the grain of the wood. Of course I don’t have any good photos of us doing it the right way. Here's one, but you can't really see what I'm doing. When applying the finish, it is important to move into the wet from the dry whenever possible. This helps to eliminate 'stop' marks that you would get from starting in a wet area and pulling into the dry. Keep in mind that oil based poly dries slower, giving you more time to 'work' with the wet finish. You have to maintain a wet edge at all times when working. Water-based poly will dry within minutes, so it is not very forgiving for newbies! We used the brush around the perimeter of the rooms, seconds before going over the middle of the same area of the room with the applicator. Try not to get too far ahead with the edging, you want to do the edges and the middle at the same time. Again, do not go across the grain as this (BAD BAD) picture shows. I ended up doing all of this portion of the hallway with the brush, it just was easier in that tight area. Finally, we were done with the first coat. We let each coat dry for a day, even though the can says you can recoat after 4 hours. We just kept running out of daylight. 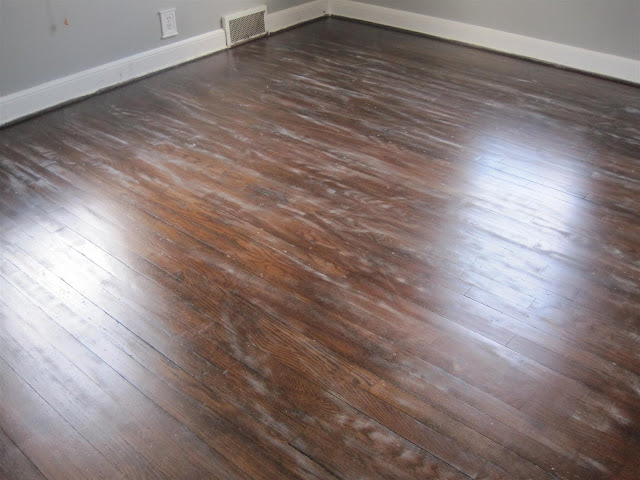 After the coat is dry, it's important to scuff sand before laying down another coat. We used 220 grit on a pole sander to scuff up the finish and get rid of bubbles, hairs, fuzzies, etc. Don't be alarmed, you won't see any of this white stuff after you do another coat. Before coating again, use your tack cloth, and vacuum if there is alot of dust. Always use a new applicator, don't even attempt to wash those things out. If you are not keen on the lambskin applicator, we also tried a fancy 'professional' applicator with moderate success for the third coat, but the technique was a little to difficult to master this late in the game, so we went back to the lamb for the fourth coat. These are really fun for seeing what you would look like in a fat suit. Plus, my hair is in a plastic bag. Klassy! After all four coats, things are looking pretty good. Finished floor pics tomorrow! Phew! I was exhausted just reading the post! They are looking great! I can't wait to see the finished product tomorrow! Ughh, I feel your pain! I love the look of satin finish, though. We still need to do our hallway, office and guest bedroom. I found that I liked using the water based poly better than oil, but we have small rooms. And our finish isn't perfect, in fact it might be hard to tell we refinished the floor in our bedroom. Oh well...someday! Love your play by plays, by the way. I've bookmarked some of them for future reference. LOVE the space suits. : ) The floors are already looking AWESOME. Can't wait to see the final after pics! Will you hate me if I say you look a teensy bit like Mario? Except OBVIOUSLY not that squat. :-) Your floors look beautiful. Did you catch my bro's response to your comment yesterday? He said to maybe try another electrician if you really want recessed lights... some of them just really don't want to do it knowing that it's a PITA but you may find one who needs the work and is willing to attempt it. This is a hard job...so excited for you that you tackled it. Can't wait to see the final look. Man - what a project! Looking good!! What dedication.....you guys should so so proud of yourself for DIYing. The floors look fab and you two definitely know what you are doing! Can't wait to see final final picture! This looks like a ton of work but from seeing the AFTER pictures I can tell it was TOTALLY worth it!